The Lenovo ThinkPad X220 has been put under the spotlight and given a thorough review by the folks at Engadget, they check out some of the better aspects and some of the low points to the new ThinkPad which prospective buyers will find useful. 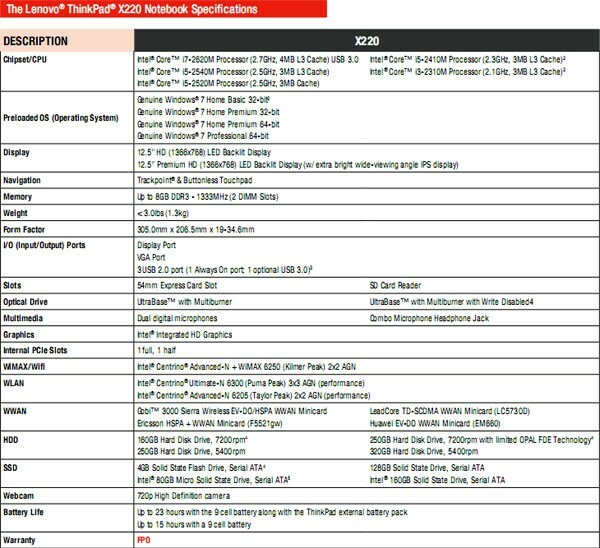 The new ThinkPads will come with a wide variety of options in terms of specs, buyers will be able to choose from HDD’s ranging from 160GB to 320GB of storage or they can select a SSD ranging from 80GB to 160GB of storage. The laptops will come with up to 8GB DDR3 and CPU’s can branch across from Intel Core i3 to Intel Core i7 processors. Engadget described the new laptops as having the same style and look as previous Thinkpad models, however being packed with all the latest technology in computer hardware. They gave it a very good review which can be read here while an image to look at a full breakdown of the specs for the laptops can be seen here. Engadget seemed blown away by the fact that the Thinkpad X220’s optional extended battery could offer 15 hours of battery life, even the standard battery would allow for up to 8 hours of battery life .The extended battery costs an additional $179, however there is no other ultraportable which comes close to this in terms of battery life, therefore $179 seems like a relatively small price to pay. Overall the message seems good from the review and the specs are equally impressive, but is it about time that Lenovo redesigned their Thinkpad’s design, let’s face it they do look quite dated.